Next Wednesday, Saturday, or Sunday that you go to the Rocklea Markets, make sure you take some time out at Black Sheep Coffee (not to be confused with the NSW Black Sheep Coffee Roasters). Mark Gloftis, the friendly owner of Black Sheep Coffee, has been roasting his own beans for 13 years and wanted to set up a coffee joint that was a little rebellious in the fact that it wasn't Italian; the black sheep of the coffee world, if you will. Each coffee bean is organic and handpicked for taste and quality. Wonderfully designed bags of coffee also let you take the goodness home or to give as a gift to a much adored coffee lover. Coffee bags can also be purchased online (page will be up soon). 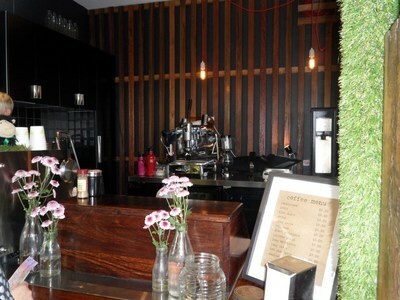 The coffee stall is an interior delight, looking like something out of an interior design magazine. My only criticism, is that I wish the inside area was a lot bigger because it is so lovely. With time and money, we may see a Black Sheep Coffee Café someday. 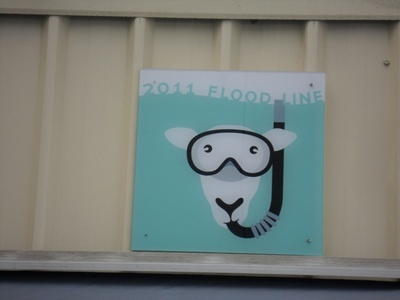 A flood sign has also recently been added as a reminder of 2011 January floods which completely inundated the Rocklea Markets. As the only permanent stall, Black Sheep Coffee was quite affected by the floods, and thanks to loyal patronage is getting back on its feet again. My chai latte that I ordered was prompt, and full of lovely foam, a real treat on the rainy day I ventured to the markets. 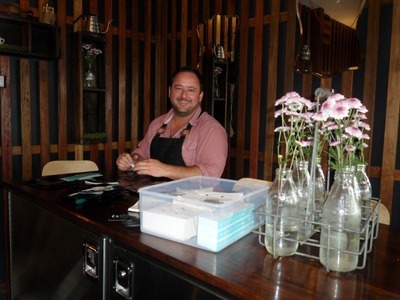 The staff were also a delight to chat to, and are as friendly and funny as Mark himself. This is just the place to go if you need a pick me up after wandering around the markets. Mark also has a small coffee cart two stalls down from Black Sheep Coffee for busy times.